In the western most point of the Yakima Valley appellation stands the much praised Red Willow Vineyard. Planted and farmed by the multi-generational Sauer family, Red Willow’s iconic landmark is the Monsignor Chapel, built by the family as an homage to the many chapel vineyards in France. A favorite site of resident photographer Richard Duval, the chapel is as distinctive as the grapes. 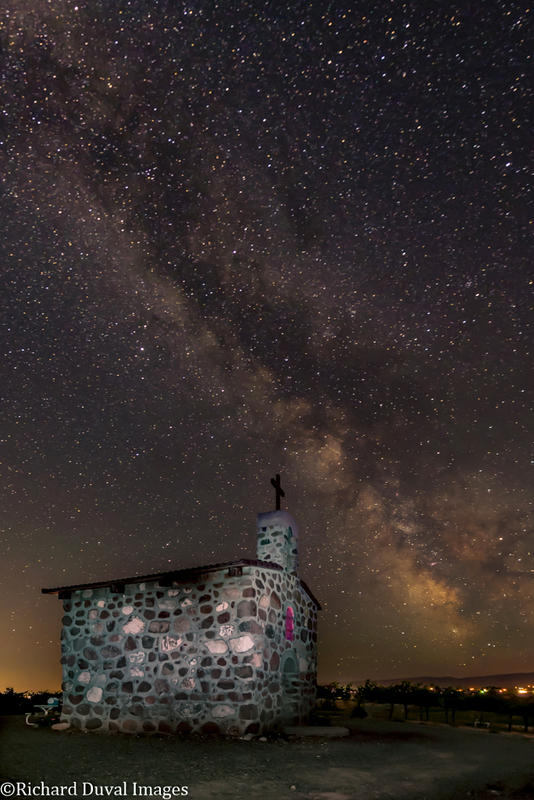 Aiming to capture a truly spiritual image that reflected Red Willow’s beauty and reverence, Duval and associate Chris Rider, an experienced night sky photographer, enlisted a clear summer night and the vineyard’s 1,300 foot elevation to capture the Milky Way. Starting at 11 pm and shooting till nearly 3:00 am, they captured nearly two dozen striking images. Click on the picture to see a higher resolution image.